Full-event passes will go on-sale Friday, February 17, 2017 at 10 A.M. EST only at www.wayhome.com - with Tier 1 General Admission passes priced at $229.99 and VIP passes priced at $599.99. WayHome Music & Arts, produced by Republic Live, is a three-day music and arts festival held at the custom-designed camping festival grounds, Burl’s Creek. In it’s inaugural year, WayHome featured headliners Neil Young, Sam Smith, Kendrick Lamar, along with Alt-J, Modest Mouse, Hozier and many more. 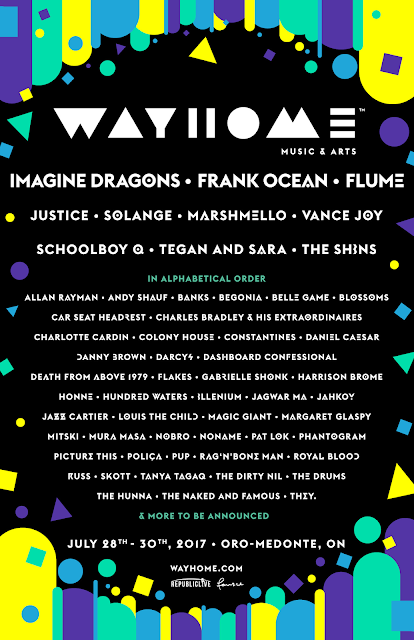 In it’s second year, WayHome Music and Arts 2016 featured LCD Soundsystem, Arcade Fire and The Killers, in addition to performances by Major Lazer, M83, HAIM, Metric, Chvrches, Ray LaMontagne, and 60+ more artists. The festival offers multiple stages, a variety of late-night spectacles and experiences, international and local cuisine, an on-site locally produced farmers market, original art installations - past artists include internally acclaimed artist such as; DoLab and Angus Watt, and more to 40,000+ fans over the course of the weekend. WayHome Music and Arts was recently awarded the New Kid on the Block (Best New Festival) award and was nominated for Major Festival of the Year at the 2016 Canadian Music Awards. Save the date for 2017 as WayHome will be taking place July 28th – 30th 2017 at Burl’s Creek Event Grounds. www.wayhome.com.